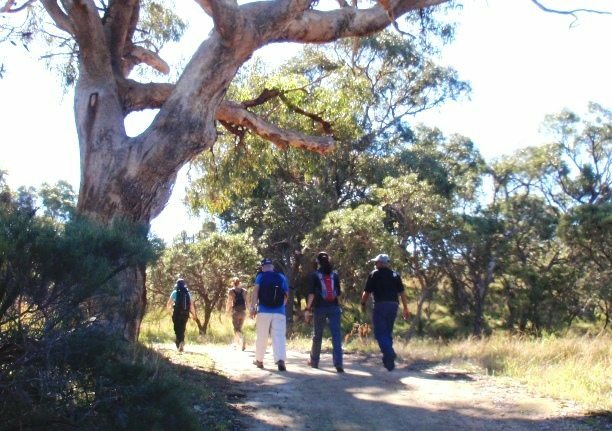 Bold Park’s hilly terrain, covered mainly by tuart and banksia woodlands and heath, offers varied and very enjoyable bushland walking despite the close proximity to suburbia. The remnant coastal bushland of the Park makes an interesting change from the forests and woodlands of the Darling Range. The Park also offers panoramic views of the Indian Ocean to the west and Perth City and distant Darling Range to the east. An excellent time to do the walk is early morning just after sunrise when the Park’s abundant bird-life is stirring. 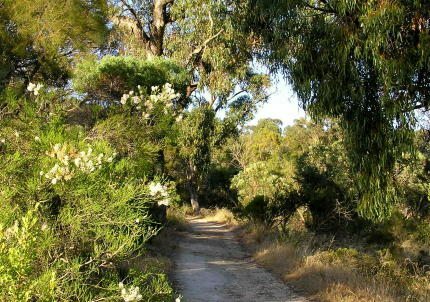 Bold Park is perhaps not as widely known as Kings Park yet this Class A nature reserve is slightly larger, and its hilly terrain, covered mainly by tuart and banksia woodlands and heath, offers varied and very enjoyable bushland walking despite the close proximity to suburbia. 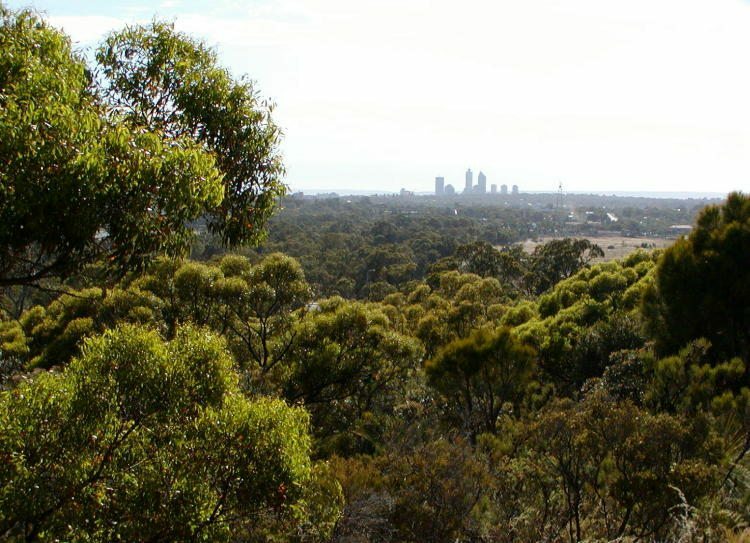 Reabold Hill (elevation 93m) is the highest natural point on the Swan Coastal Plain within the Perth metro area. The remnant coastal bushland of the Park makes an interesting change from the jarrah-marri forest which dominates the Darling Range. The Park also offers panoramic views of the Indian Ocean to the west and Perth City and distant Darling Range to the east. There is a total of almost 14km of well maintained walking trails through the Park. The circuit recommended on this page can be walked in less than 2-1/2 hours at an easy pace and covers about 75% of the existing trails with minimal overlap. An excellent time to do the walk is early morning just after sunrise when the Park’s abundant bird-life is stirring; around 90 bird species have been identified including those just ‘passing through’ and several introduced species, including the unfortunately now pervasive and noisy Rainbow Lorikeet (an aviary escapee; native to the coastal strip of eastern Australia). Early morning walks are also undisturbed by the intrusive noise from the Swanbourne Rifle Range, only about 1km SSW of the Park. An additional special feature to take in before starting this walk is the short boardwalk from the carpark to the summit area of Reabold Hill.The magnificent restoration in recent years of this summit area (and other parts of the Park) with native vegetation is a great tribute to the dedicated efforts of the Park management and community volunteers who appear to be fast realising the vision for the Park (see BGPA below) of achieving a recognised “world class urban wilderness….”. The 9km ‘route’ recommended here is entirely on the existing, mostly well-marked trails. GPS is obviously not required but waypoints are provided here in case you are new to GPS and would like to test your GPS navigation skills. Before heading off down the trail make sure you first walk the quick (200m) Reabold Hill Summit Boardwalk (to waypoint ‘1A’) which is next to the carpark, then from the Start point head down the trail to waypoint ‘2’, then turn left onto the Camel Lake Trail to follow it downhill. Then take the first sidetrack on the right at ‘3’ and soon after (at ‘4’) take the left branch of the trail. (The right branch heads west back up the hill). This section of the Trail passes close by ‘Camel Lake’, an area that was once a semi-permanent wetland (now at most a puddle) and was used as a camel watering stop by explorer Ernest Giles on his 1875 journey from Augusta to Perth. On reaching a trail junction at ‘5’, turn right to follow the Yoorn Walk uphill. Continue past the ‘Pine Walk’ turn on the left at ‘6’ and follow a section of the Zamia Trail to the ridge at ‘7’. Turn left and after about 150m (at ‘8’) veer right to follow the Banksia Walk, initially uphill. When the Banksia Walk meets the Sheoak Walk (at ‘9’), turn left to follow the Sheoak Walk back to meet the Pine Walk at ‘10’. Follow the Pine Walk south past the pine plantation on the left and meet the Zamia Trail at ’10-A’. Then veer west to reach the start of the Balga Walk on the left (at ’11’ or ’16’). 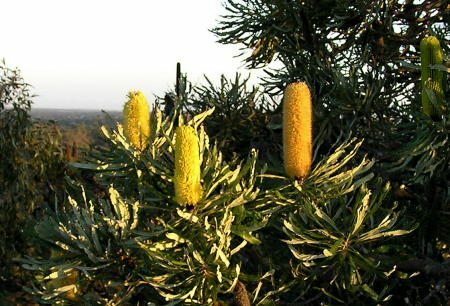 Follow Balga Walk (via ’12’, ’13’, ’14’ and ’15’) to return to the Zamia Trail (at ’16’). Then follow the Zamia Trail via ’17’ to ’21’. Make a short diversion to the lookouts at ‘19’ and ’22’ to obtain good ocean and Rottnest Island views. Then continue along Zamia Trail (via ‘2’) to return to the Start point in the carpark. West on Cambridge Street, then continue on Oceanic Road, then turn left into Reabold Hill Scenic Drive entry (about 1km past Perry Lakes Drive on left). Follow the short Drive up the Hill and park in the carpark near the top of Reabold Hill (the Start point of this walk). Alternatively, if the Scenic Drive vehicle access gates are closed, park in the parking area near Perry House (the Wildflower Society of WA’s office), accessed off the north end of Perry Lakes Drive; then locate the start of ‘Scenic Walk’ by walking a short distance toward Oceanic Drive from the carpark. (The Botanic Gardens & Parks Authority’s Western Australian Ecology Centre is also located near the carpark.) Follow Scenic Walk for about 700m on the old (disused) single-lane road up Reabold Hill to the carpark near the summit. Check BGPA’s site for the official Reabold Hill vehicle access hours. The various trails lead to alternate exit points in the west (onto West Coast Highway), east (onto Perry Lakes Drive), and south (near West Coast Highway-Rochdale Road junction). 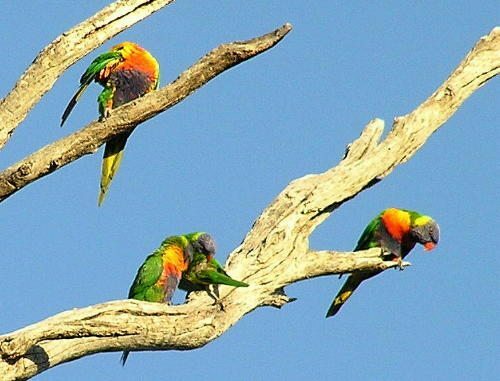 Birds of Bold Park – Birdlife Western Australia brochure. Bold Park Management Plan 2011-2016 – BGPA, 2011. 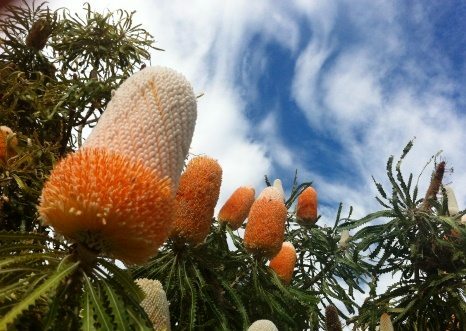 Botanic Gardens & Parks Authority (BGPA) – a good summary of the Park, including its flora & fauna and history (including a Camel Lake Heritage Trail brochure). 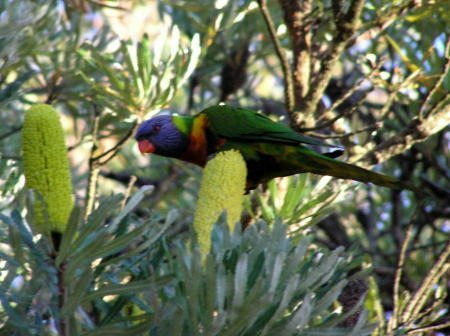 Friends of Bold Park Bushland – The community group working with the BGPA to protect the area. 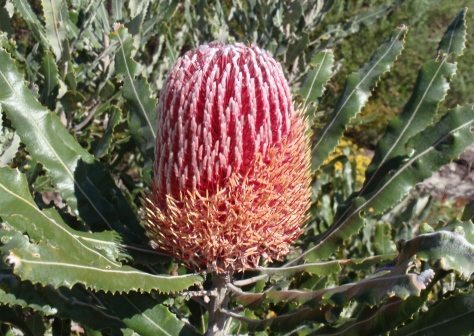 “Perth Plants – a field guide to the bushland and coastal flora of Kings Park and Bold Park, Perth, Western Australia“, Barrett, Russell L. and Tay, Eng Pin, 2005. Botanic Gardens and Parks Authority. (ISBN 0 876479 07 8). “Reabold Hill Summit Boardwalk” – Trails WA. 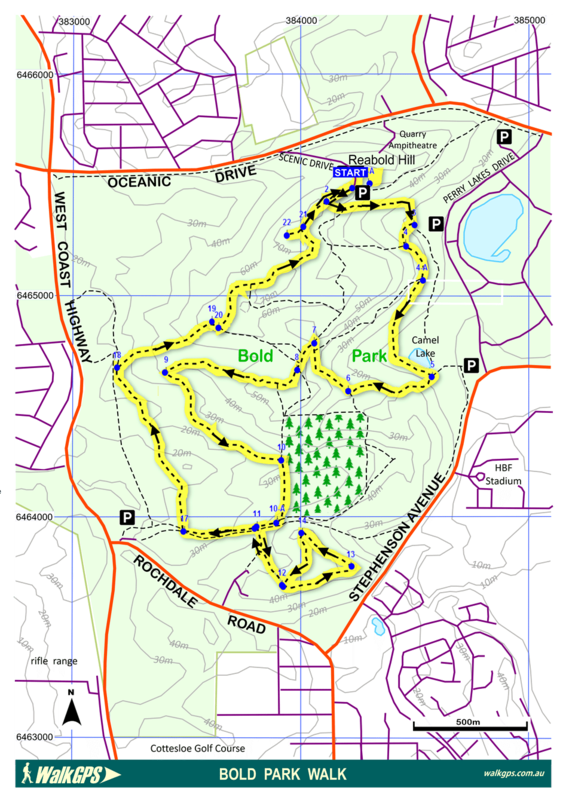 – Bold Park Trails map – Botanic Gardens & Parks Authority (BGPA). – “South West WA 25K Scale Topo Maps”, Greg Harewood & Landgate, 2015. – Digital raster; ECW format on 16GB USB. See tile #176-2034-II-SW for relevant map coverage. Bushland flanking trail near Camel Lake. 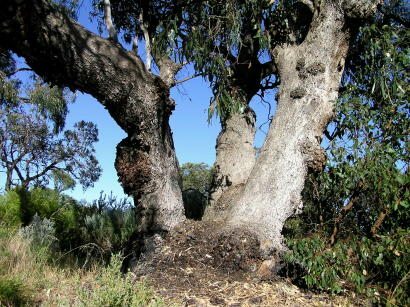 Gnarled trunks of Tuart tree (Eucalyptus gomphocephala). 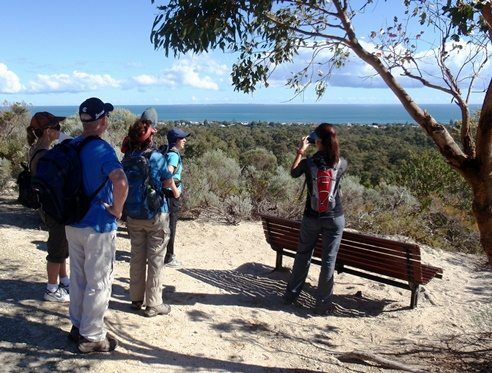 Walkers enjoy the view toward Rottnest Island. 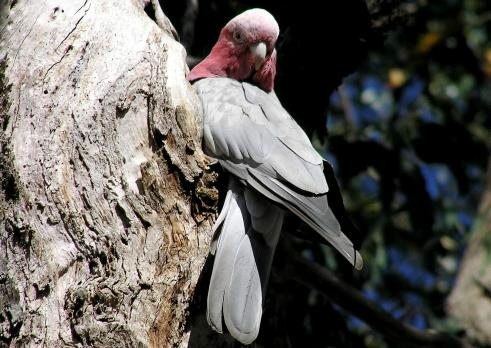 Galah (Cacatua roseicapilla) at nesting hole.